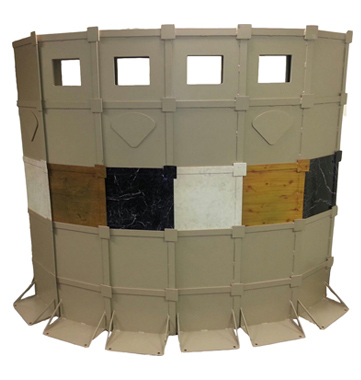 STEGO® Modular Armor System | Defenshield, Inc. The building blocks of protection. 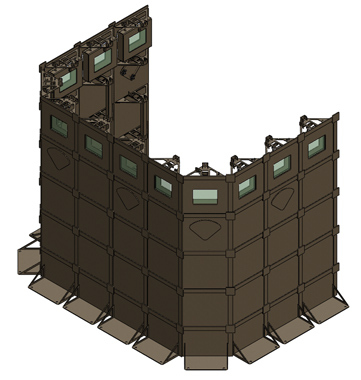 Created in collaboration with the U.S. Armed Forces, the STEGO® Modular Armor System was designed to provide ballistic protection in constantly changing threat environments. STEGO® enables security team members or fielded troops to create Tactical Operations Centers (TOC), safe houses, bunkers and other positions that are protected against rifle rounds up to NIJ Level IV 30-06 AP. STEGO® is a self-supporting, modular armor system built using a variety of blocks which are connected using attached detent pins. This design enables the user to assemble the desired configuration in minutes. A standard STEGO® kit consists of 60 blocks and can be transported by truck or trailer. Each kit contains four types of blocks to maximize the system’s capabilities and versatility in the field. Base block: Provides structural support and a solid foundation for uneven surfaces, as well as immediate armored protection for personnel. Armor block: These blocks offer full armor protection and are used most frequently. 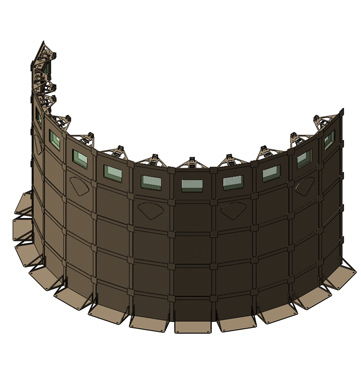 Weapons port block: Opens to allow the user to engage outside threats and transfer items through the armor system. Window block: Features user-replaceable ballistic glass to allow the user to identify approaching threats and opens to transfer larger items. If an application warrants, window, weapons port, and armor blocks may be used separately away from other kit components. 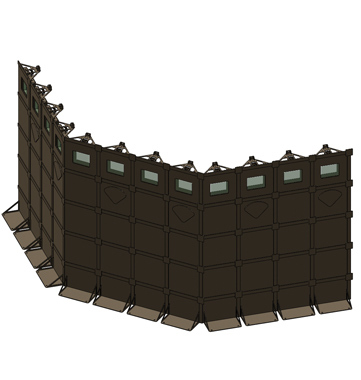 With an understanding that the needs of troops and security personnel vary across environments and applications, the STEGO® Modular Armor System can be assembled in a variety of physical configurations. Standard assemblies are 12 blocks wide by 5 blocks high, and blocks can be configured at angles ranging from 90 to 180 degrees. Semi-circular formation: Used for optimal visibility in multiple directions. 90-degree formation: Provides protection from threats in two directions. 3-sided formation: Protects from threats in three directions. U-shaped formation: Commonly used as a guardhouse at an entry control point to a base or along a road. This configuration is available with an optional weather-resistant or ballistic canopy.